The city was blanketed in a foot of snow in a storm that lasted 48 hours. For a city that gets a major snowstorm on an average of once every 7 years, it’s no surprise that everything shut down when the storm began. 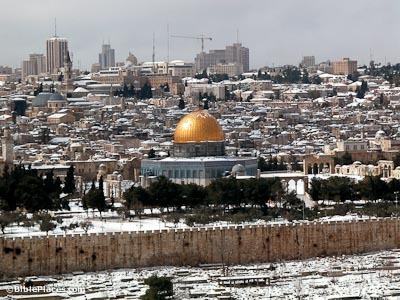 Few things better illustrate the reality that Jerusalem sits on the edge of the wilderness (desert) than this photograph. The top of the Mt. of Olives here had about a foot of snow, but only a few miles away no snow was on the ground. 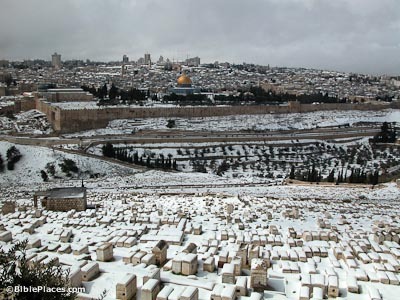 “Jerusalem of Gold” was for a few days a “Jerusalem of White.” The 80,000 tombs on the Mt. of Olives make a decorative foreground. The snow here lasts longer than other places, because of the lack of traffic. 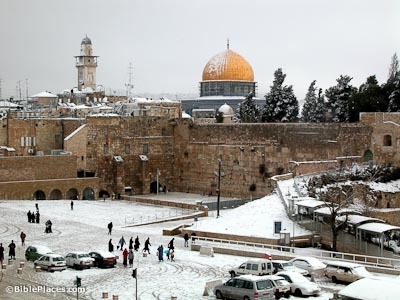 Snow clings to the dome of the Muslim shrine and to the rooftops of the Old City in the background. It is interesting to note that while snow is mentioned in Scripture, it is only part of one narrative passage. 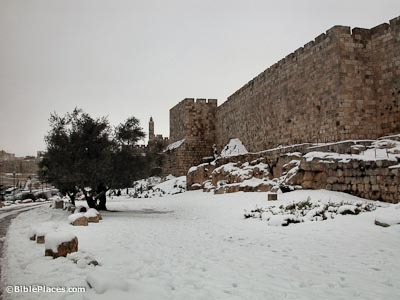 David’s mighty man Benaiah is credited with having killed a lion in a pit on a snowy day (2 Sam 23:20). 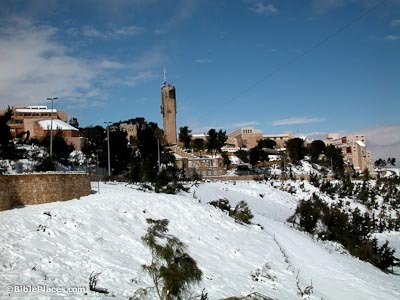 Hebrew University and the schools in the Jerusalem area were closed for three days because of road conditions. Schools were set to re-open on Friday for a shortened day of classes before the Sabbath. 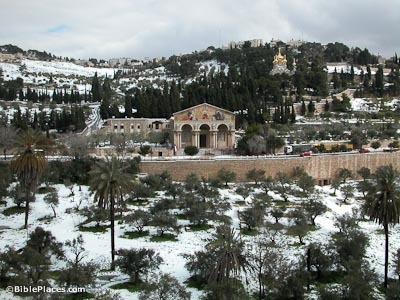 The Church of All Nations and the Russian Orthodox Church of Mary Magdalene stand out on the Mt. of Olives. 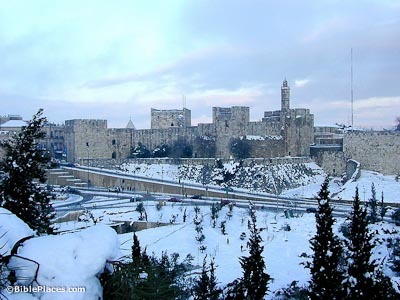 In 1911 Jerusalem had 11 straight days of snowfall. The record amount of snowfall in modern times is 3 feet, which fell in 1920. 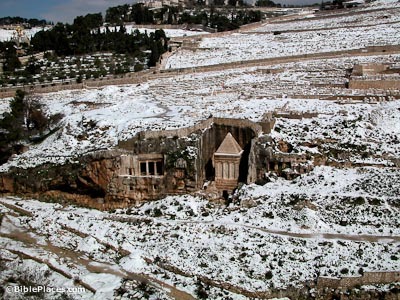 The Second Temple period tombs in the Kidron Valley are usually surrounded by the white stone of tombstones. The whiteness of the snow almost makes the stone seem brown by comparison. 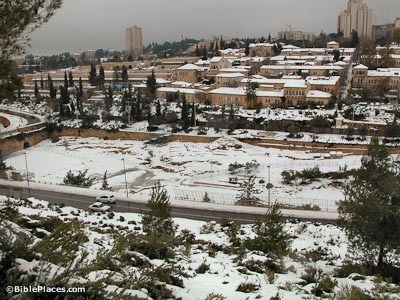 Snow was reported to fall in small measure as far south as Mizpe Ramon, 80 miles (130 km) south of Jerusalem (about the same latitude as Ensenada, Mexico or Jacksonville, Florida). One of the most beautiful scenes in the city is the western wall of the Old City with the Citadel of David jutting into the sky. This snowstorm caused flights coming in and out of the international airport in Tel Aviv to be delayed or diverted. The snow fell rather continuously on the first night and day. A break for a few minutes was rare but welcome, and provided the opportunity for a unique photo when almost no one was praying at the Western Wall. Other parts of the country enjoyed high amounts of rainfall, including 3 inches in Ashdod. A 21-year-old man was killed when he attempted to cross a flooded river in his cart. A 13-year-old boy was swept away when playing with friends on a pipe over a river. 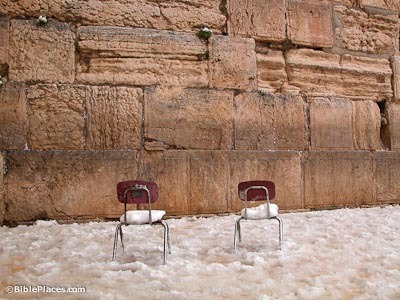 The Western Wall of the Old City. 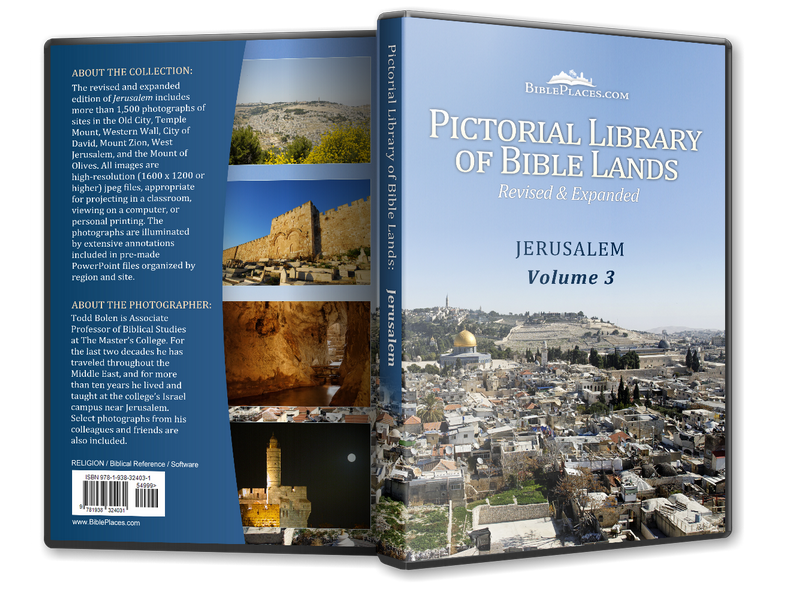 Jaffa Gate is far left, Mount Zion is far right and the Mount of Olives is on the horizon.